There's recycling, and then there's Recycling, the Nogrady way. 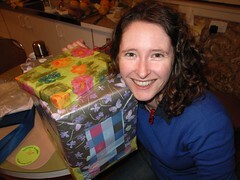 If you look closely at this photo, you'll notice there are three different kinds of pre-loved wrapping paper that have gone into wrapping this birthday present. My family (actually, we can narrow that down to my Mum) has an obsession with reusing wrapping paper, to the extent that our Christmas presents are often wrapped in paper that I remember being on Christmas presents when I was a kid. My brother has added his own unique take on this practice, by wrapping our Christmas presents in items of his clothing, including underwear (thankfully washed first). Mum and Dad might drive an enormous fuel-guzzler but i feel they have more than compensated for this environmental blight by the sheer number of trees saved from being reincarnated as wrapping paper.